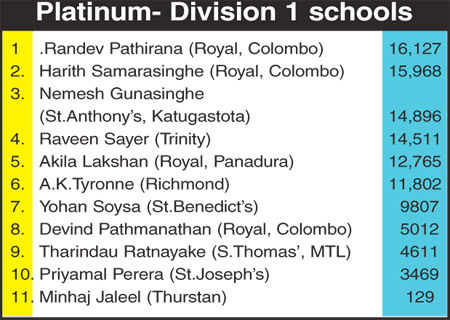 The fight for the first place between the two Royalists Randev Pathirana (16,127)and Harith Samarasinghe (15,968) is becoming intense as the deficit between the first Pathirana and second Samarasinghe has boiled down to just 159 votes at the end of count number 6 in the Sunday Observer/Mobitel Most Popular Schoolboy Cricketer Of The year contest ‘platinum’ category for division one schools. 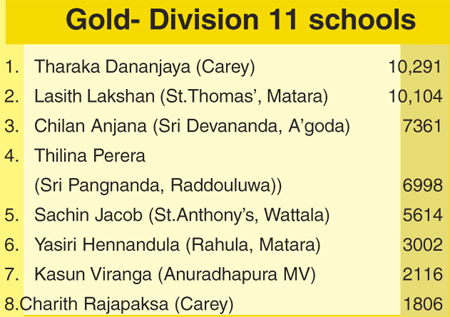 In the ‘gold’ segment the tussle between Lasith Lakshan of St. Thomas’, Matara and Tharaka Dananjaya of Carey is also hotting up with Dananjaya climbing up to the first place this week polling 10,291 votes to Lakshan’s 10,104 votes. 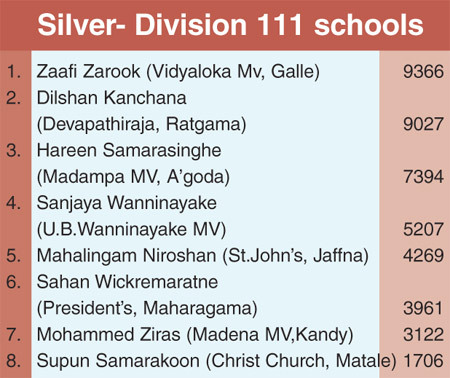 In the ‘silver’ Zaafi Zarook (9366) of Vidyaloka, Galle took over the lead from last week’s winner Devapathiraja’s Dilashan Kanchana (9027).